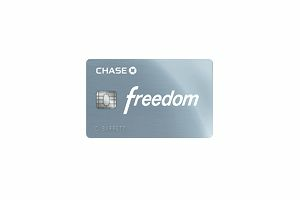 The Chase Freedom Card might be a better alternative to the Discover Card for some. Since it's a Visa or MasterCard, it's more widely accepted. It also pays higher rewards than Discover. The Chase Freedom credit card was designed for people who want to earn cash rewards on their credit card spending. Consumers with fair to excellent credit (660+) can qualify. In addition to the rewards, the Chase Freedom card offers 0 percent interest for first 15 billing cycles on purchases and balance transfers then 16.74 percent to 25.49 percent APR after the introductory period ends, depending on your credit history. Cash advances carry a higher APR of 26.74 percent. Higher than average cash back rewards. Rewards can also be redeemed for merchandise, travel, and gift cards. Unlimited rewards that never expire. You must sign up to get the 5 percent cash back premium. 10 percent bonus if you also have a Chase checking account. Up to 20 percent back at Chase merchant partners. The Chase Freedom Card is Chase's answer to the Discover Card, with a similar rewards structure: 5 percent on categories that rotate every three months. But, since it's a MasterCard or Visa card, it's accepted at more places than Discover and American Express. You can earn 5 percent back on certain purchases. For example, from January to March 2018, you could earn 5 percent on spending at gas stations, drugstores, and Starbucks stores. However, to get that bonus, you must proactively sign up with Chase, either by phone or online (Discover has a similar program). Cash rewards can be redeemed for as little as $20 (same as Discover); they can also be redeemed for travel, gift cards, and merchandise. Chase Freedom Card includes Chase's new Blueprint program, which allows you to pay off some of your purchases without incurring interest while setting up a payment plan for the rest. The Chase Freedom Card is great for those looking for a cash-back rewards card. However, avoid carrying a balance on this card. Never carry a balance on the same card where you're trying to earn rewards, as you'll just wind up increasing the size of your balance, which will only increase your finance charges, more than wiping out any rewards you earn.